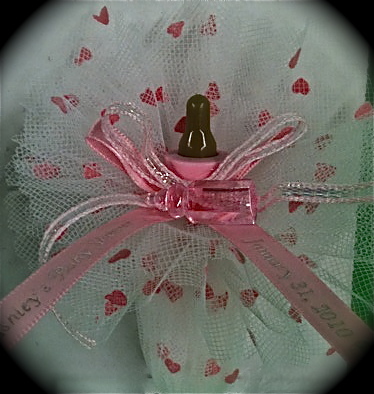 This cute baby bottle favor is filled with Baby Powder scented favor crystals. This kit includes - 25 - 3" fillable bottles, 25 bottle trinkets, 1 - 2 pound bag of favor crystals, iridescent ribbon, 25 imprinted favor ribbons, and a pack of 25 flocked heart tulle. Assembly is not included, but we can make them for you for only .75 each for labor.